It’s hard to believe it’s been 7 years since I took my first trip on a plane, my first trip out of the United States. While the years seem to have flown by, it is a memory that will be stuck in the back of my mind forever. I had been begging my parents to take part in the Summer Exchange program when I was ending my junior year of high school. A girl from our school was studying abroad in Thailand, and I wanted to have the same amazing, study-abroad experience. I knew I wanted to go to Asia, because it fascinated me and everyone always picks Europe anyway (Not that I would not love to travel there one day). The choices were Thailand and Taiwan. Wanting to have my own unique international experience, I chose Taiwan, putting it at the top of my list, without knowing a thing about it. Eventually, after nagging my parents, they said yes. 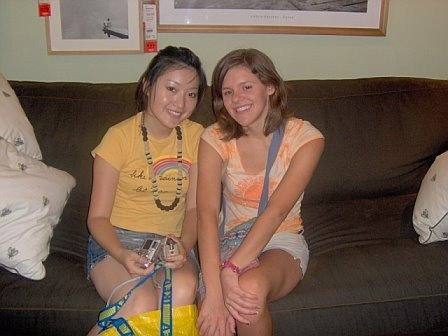 And that summer, I met “Stephanie”, my Taiwanese host-sister. The way the exchange worked is that you are matched with someone from your country of choice, and they travel to your home country to stay with your family for a month. Then, you travel with them to their home country and live with their family for a month. That summer, Stephanie became part of my family. We had a blast. It wasn’t until the days approaching the international flight that I became increasingly anxious and doubtful. What was I doing? I had never been out of the country before, and I was about to embark on a 14 hour journey to the other side of the planet. It started to dawn on me that I would be literally thousands of miles away from home, my familiarity, and I was beginning to wonder if I had made a mistake. Stephanie and I had a 12-hour layover in L.A. We spent it eating, walking around, and browsing the shops at LAX, watching the planes take off, heading to their destinations. Unfortunately, Stephanie and I were unable to book the same flight to Taipei, but our seperate flights were scheduled to leave at about the same time, around 1 AM, Pacific time. As a trip that was once months ahead when I applied for the program turned into minutes from departure, I had my final and most severe rush of anxiety. After Stephanie hugged me and headed to her own gate, I called my parents, at what was 2 or 3 in the morning Wisconsin time. I cried and confessed my fears. I felt terrible, as the trip I had begged them to take was now causing me so much worry that I was passing the anxiety to them. They assured me I would be OK, and I did all I could do…force myself to board the flight and make the journey. I was so nervous that I barely had an appetite. I remember our take-off, flying over the Pacific Ocean, leaving the American coast behind. My Mandarin phrase-book in my bag, and the flight-attendants offering the little English they knew to make my trip more comfortable. I was scheduled to land in Taipei around 5 in the morning, Taiwan time. After 14 hours of minimal sleep, and limited nourishment, came one of the most memorable experiences in Taiwan before I even left the aircraft. I remember as we started our descent–the beautiful city. As the plane tipped to its side, all I saw were lights. I remember being in such awe. Maybe it was the dehydration or the jet-lag, but I remember being so enthralled, I knew I would never forget that sight. The experiences and lessons I learned on my first international trip would fill up pages and pages. But one of the lessons I learned those 7 years ago was to face your fears and to step outside your comfort zone. After all, that’s what living life is all about.